HONG KONG, Feb. 7, 2019 /PRNewswire/ -- Bithumb Global Limited, a Hong Kong-based entity, announced the official launch of its block deal, matchmaking service catering to institutional clients under the Ortus brand. Institutions will undergo a strict onboarding process, whereby sufficient KYC and AML documentation must be supplied by the applicants. ''Institutions trading digital assets need to open accounts at exchanges and OTC desks around the world; however, there is no real solution for an aggregated liquidity provider or a trusted interdealer where Institutions can trade these assets. To fill this market gap, Ortus will operate to allow institutions to buy and sell digital assets through a network of global liquidity providers and benefit from a competitive and best price execution service.'' said Rahul Khanna, Director. Competitive pricing from the world's largest OTC desks and liquidity providers. 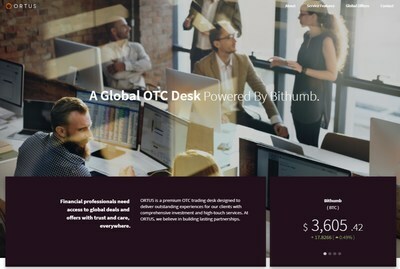 Bithumb Global Limited, a Hong Kong-based entity, owns the rights to the Ortus brand. Ortus is a block deal, matchmaking service specifically for institutional clients around the world.